If you have ever been to a Chiropractor, you have probably undergone the necessary paperwork followed by an in-depth chat with your doctor about your personal and family medical history and then a battery of testing including a neurological, orthopedic, and postural evaluation. At our office we then send out for any required specialized testing such as Radiographs (x-rays) so we can make sure we have all the pertinent information to give you the correct diagnosis. Once we have collected all test results, we present the patient with a Report of Findings where we will explain all of our findings, how chiropractic works, and where we see the treatment plan going! More often than not, we find most patients pain and or dysfunction stems from a misalignment of the vertebrae (bones/joints) reducing the IVF (space between the bones) where the nerve exits and travels to its end organ. This phenomenon is known as a Subluxation. 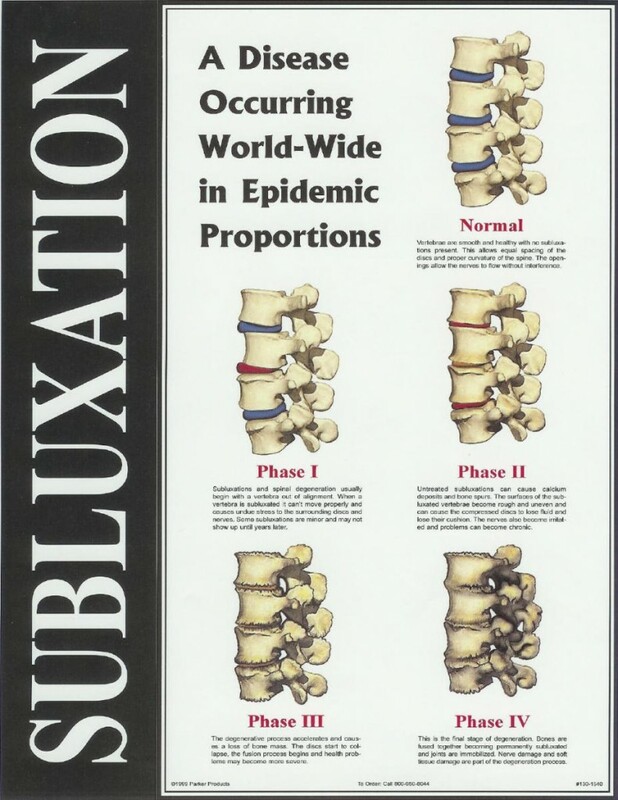 When subluxations occur and persist without care, the surrounding structures become involved and display less than optimal results on your health and wellness. Let’s take a look at the components of the Vertebral Subluxation Complex (VSC). In this stage, the vertebrae are out of alignment which causes increases stress on joints, ligaments, and discs. You may experience a sensation of locking or clicking joints along with pain, reduced range of motion, postural imbalance and potentially decreased engery and increased fatigue. In this next stage, the nerves become “pinched” within the space of the IVFs which results in abnormal nerve function and therefore altered end organ function. When tissue gets involved, you experience redness, swelling, and tender areas that become painful to the touch. It should be mentioned that repetitive wear and tear on tissues and joints can lead to arthritic changes and degeneration. Muscle involvement results in weakened, chronically tense muscles that can show signs of spasm and postural distortion. This is when your chiropractor may find numerous trigger points that require release, muscle stripping, myofascial release or adjunct therapies along with your chiropractic adjustment. We hope you are not at this point in the complex! The whole body is now involved and we start seeing degenerative changes such as spinal deformation (bone & disc), Dis-ease (body malfunction), accelerated aging, chronic fatigue, lowered immunoresponse and resistance to disease. It takes a lot more work to get a spine like this healthy and pain-free, so we recommend taking preventative measures–get adjusted before any sign or symptom of pain or dysfunction. Chiropractic adjustments are meant to be part of a healthy lifestyle, like brushing your teeth or eating right. Chiropractors keep the subluxations at bay, correcting any misalignments and allowing your body to work at its optimal potential. Most wellness patients visit our office anywhere from once a week to to once a month, depending on their body and its requirements. Let us get you subluxation free! Come on into Oakville Chiropractic Centre and tell us the 5 stages of the VSC and receive a free EMT session following your first adjustment!